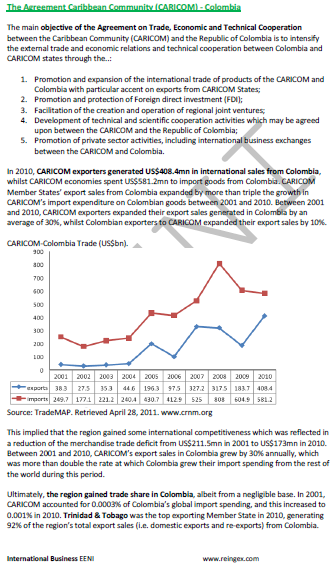 Foreign Trade with Canada and the U.S. The Member States of the Caribbean Community and Common Market are Antigua and Barbuda, The Bahamas, Barbados, Belize, Dominica, Grenada, Guyana, Haiti, Jamaica, Montserrat, Saint Lucia, St. Kitts and Nevis, St. Vincent and the Grenadines, Suriname, and Trinidad and Tobago. 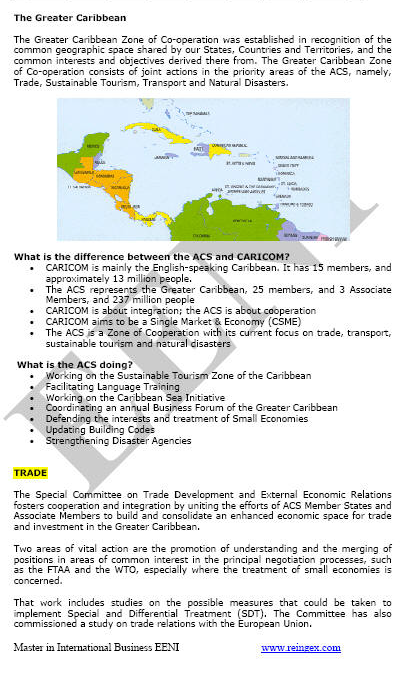 Anguilla, Bermuda, British Virgin Islands, Cayman Islands, Turks anCaicos Islands are associate members of the CARICOM. 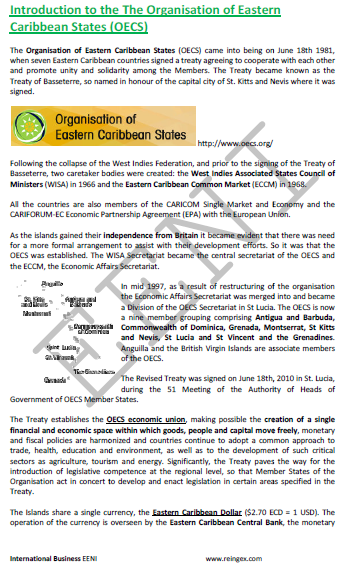 The member countries of the Organisation of Eastern Caribbean States are Antigua and Barbuda, Commonwealth of Dominica, Grenada, Montserrat, St Kitts and Nevis, St Lucia, and St Vincent and the Grenadines (All members of the CARICOM). Anguilla and the British Virgin Islands are associate members of the Organisation of Eastern Caribbean States. 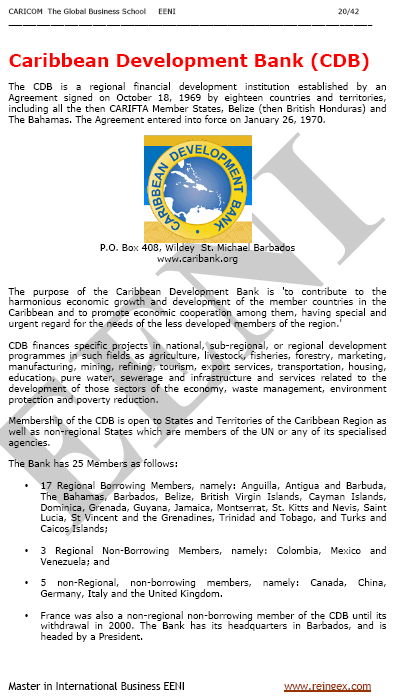 The beneficiary countries of the Caribbean Basin Economic Recovery Act are Antigua and Barbuda, Aruba, the Bahamas, Barbados (*), Belize (*), British Virgin Islands, Curacao (*), Dominica, Grenada, Guyana (*), Haiti (*), Jamaica (*), Montserrat, St. Kitts and Nevis, St. Lucia (*), St. Vincent and the Grenadines, and Trinidad and Tobago (*). 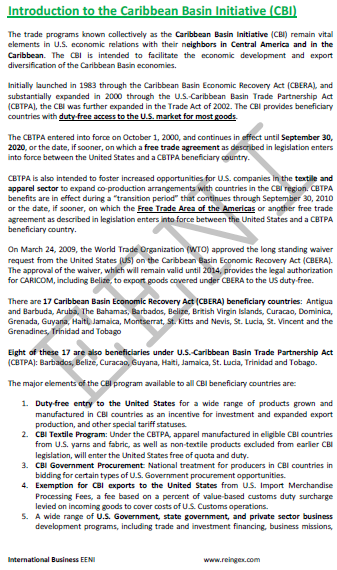 (*) beneficiary countries also of the United States-Caribbean Basin Trade Partnership Act. 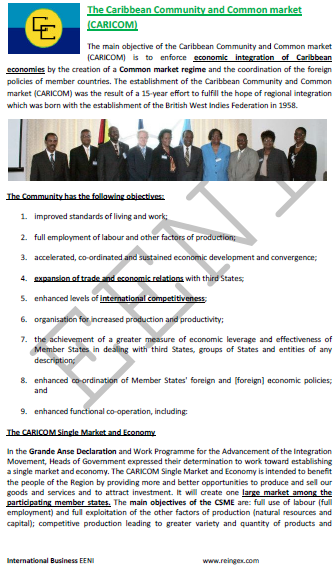 The member countries of the Association of Caribbean States are Antigua and Barbuda, the Bahamas, Barbados, Belize, Colombia, Costa Rica, Cuba, Dominica, Dominican Republic, El Salvador, Grenada, Guatemala, Guyana, Haiti, Honduras, Jamaica, the United Mexican States, Nicaragua, Panama, Saint Kitts and Nevis, Saint Lucia, Saint Vincent and the Grenadines, Suriname, Trinidad and Tobago, and Venezuela. The associate members of the ACS are Aruba, France (on behalf of the French Guiana, Guadeloupe, and Martinique), the Netherlands Antilles and Turks and Caicos. The Caribbean countries members of the SELA are the Bahamas, Barbados, Cuba, Haiti, Jamaica, the Dominican Republic, Suriname, and Trinidad and Tobago.